Iconic Aussie Restaurant Helps Spark a Blue Revolution for Oceans – You Can Too! Aquaculture is one of the fastest-growing food production industries in the world; today, nearly half of the fish we eat are farmed. As the industry expands, it’s more important than ever to ensure that farming in the ocean is sustainable. That’s what compelled Parker’s Port Douglas, Australia, restaurant to join our chef campaign in support of healthy oceans! “I support the Blue Revolution,” says Anthony Parker of Nautilus. 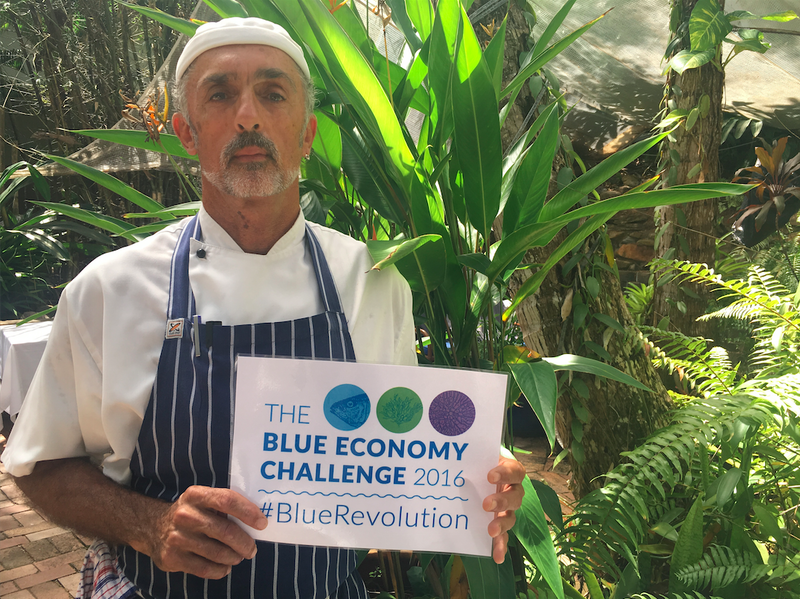 “I support a great environment.” The #BlueRevolution campaign begins today, when chefs and foodies from around the world are encouraged to share sustainable seafood recipes with #BlueRevolution. It’s the newest phase in the Australian government’s Blue Economy Challenge, a call for sustainable innovations in aquaculture to contribute to global food security. Nautilus General Manager Aron Michielli says he’s planning a special menu for June 8, World Oceans Day, in support of healthy oceans. The campaign will culminate a month later on World Oceans Day, when a roundup of the most popular recipes shared using #BlueRevolution will be posted on the Blue Economy Challenge blog. Technological innovation alone will not make our oceans healthier. We need a culture shift towards environmentally friendly sources of protein. Our goal is to broaden the number of products from our oceans so that the world’s growing population will continue to have reliable and sustainable sources of food. The Blue Economy Challenge is seeking applications for new ocean products that will expand the diversity, sustainability, and quality of aquaculture products. Find out more about the Blue Economy Challenge by visiting theblueeconomychallenge.com.